Car shampoo is definitely an indispensable cleaning product for any car owner, vehicle service stations. But you need to know the harm that liquid detergents along with other generic cleaners can inflict on their vehicles. We may make use of the caustic chemicals which are hazardous to the vehicle, our health, and also the environment. In that case, how to choose the righ car wash shampoo or car wash detergent is important things. What we can do? Always provide the eco car wash shampoo ingredigents with our customer. ♣ Super concentrated car wash powder. ♣ Eco-friendly ingredients, formula of car wash shampoo. ♣ It's wipe-free car cleaning product. ♣ Save transport cost and car wash cost. Economize cost of your car wash shampoo? formula that gently foams away tough dirt, road grime and contaminants without stripping wax protection. instead of grind into the paint. Dissolves immediately in hot or cold water. It's eco-friendly car wash product. formula and Ingredients. To save transport cost and increase sale revenue and profit. If you're looking for the professional car detailing products, it's a good choose in there! How to make the biodegradable car wash shampoo? 5.5kgs car wash powder + 14.5kgs water=20kgs car washing liquid ! ♦ 1kg powder dissolve 2.5kgs water. ♦ Mixing the masterbatch and water in a certain proportion (1:80). 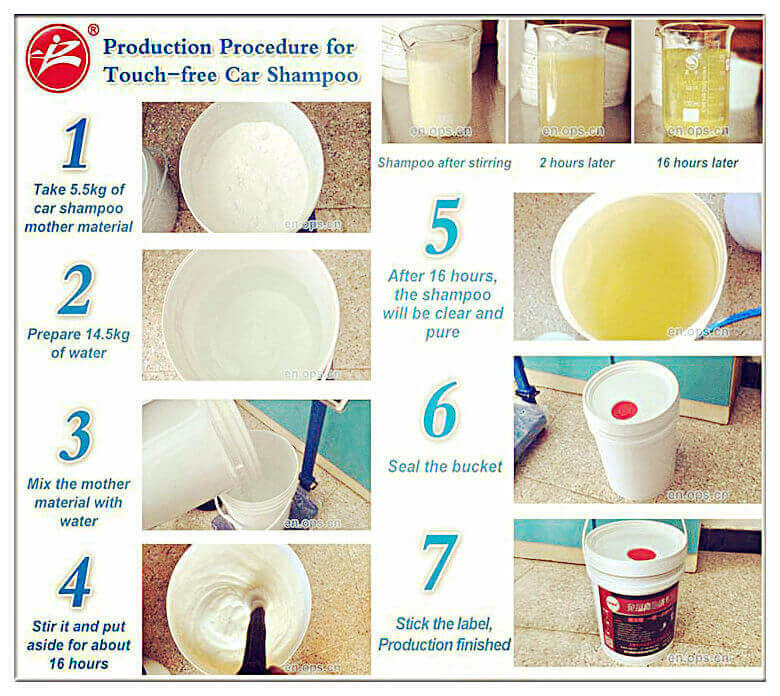 ♦ It can be turned into a superb concentrated wipe-free car washing shampoo after 16 hours. It's wonderful cleaning effect, made of 20kgs clean car wash liquid can clean 1000 vehicles! If you want to make yourselve auto cleaning shampoo or detergent. We're your good choose. Looking forward to establish good business relationship and become your car detailing product suppliers! Delivery date Around 15 days.